Is Ginger an Herb or a Spice? Cumin, a variety of spice native to Mediterranean regions, provides a bold flavor accent to food products. Each form of cumin contains anti-inflammatory and antioxidant properties, which may be useful as a form of alternative and complementary medicine, but research is scarce in evidencing the full benefit of this spice as an adjunct treatment. However, Nigella sativa, or black cumin shows promise for reducing symptoms of inflammation associated with arthritis. 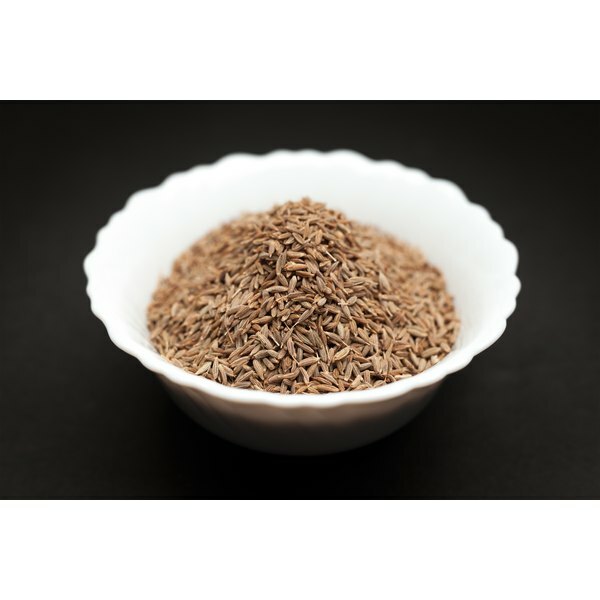 The different types of cumin include Cuminum cyminum L., Bunium persicum B., and Nigella sativa L. Each is derived from the seeds of differing small annual herb plants, but the flavor and uses vary per plant. Although Nigella sativa is referred to as black cumin, it is not related to the other forms of cumin and it resembles black caraway seed. The oil from cumin has antibacterial activity and purportedly aids in relieving indigestion and diarrhea, but clinical evidence does not exist to support such claims, notes Drugs.com. The active ingredients in black cumin include thymoquinone, dithymoquinone and thymol. These constituents are believed to act as antioxidants, anti-carcinogens and reduce inflammation associated with arthritic disease, notes the Memorial Sloan-Kettering Cancer Center. A 2007 animal study published in "Phytotherapy Research" found that the thymoquinone in black cumin effectively reduced inflammation in subjects with arthritis. A similar 2011 in vitro study published in the "Journal of Cellular Biochemistry" used isolated human cell samples to determine the effectiveness of thymoquinone on rheumatoid arthritis and results were promising. However, ongoing research is warranted to replicate study results in human subjects. The term "arthritis" refers to the breakdown of cartilage that protects your joints. Arthritis affects different body areas and may include osteoarthritis from normal wear and tear of your joints as you age, or rheumatoid arthritis, which occurs from autoimmune disease and generally presents in the extremities on both sides of the body. No matter the type of arthritis, the commonality is joint inflammation with pain, stiffness and reduction of movement surrounding the impacted joints. Medical treatment aims to minimize the symptoms experienced through use of anti-inflammatory medications, corticosteriods or a combination of prescriptions targeting the cause of arthritis. Consult your physician before using cumin to relieve inflammation associated with arthritis. Complementary methods to reduce symptoms include low-impact exercises to maintain your range of motion, massage, use of orthotic support for impacted joints and heat or ice therapy. You may also find it helpful to avoid staying in one position for too long, eating foods that do not cause inflammation including fish and nuts and engaging in stress-reduction activity like meditation.